Organizations are increasingly adopting mobile-cloud technologies to transform their business operations and reduce costs. But keeping data safe on mobile devices and in the cloud requires more than traditional desktop security. 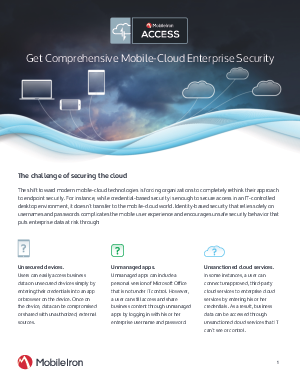 Organizations need a comprehensive, unified platform like MobileIron Access, which is designed from the ground up to secure mobile apps, devices, and cloud services. Learn more about MobileIron Access at: mobileiron.com/access.